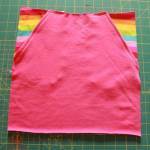 Coastal Craze Baggies Skirt Hack - Peek-a-Boo Pages - Patterns, Fabric & More! Hi there! Kasey here from Ruby Rue Creations! 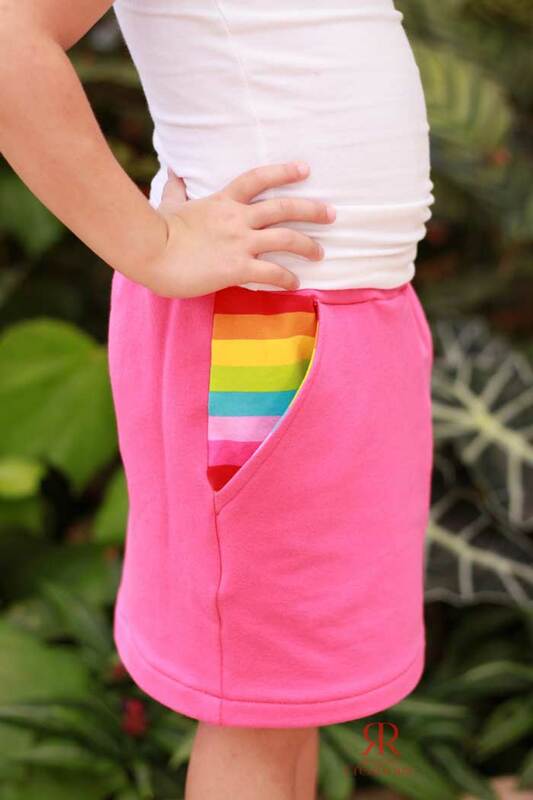 Today I’m going to show you a simple hack for the Coastal Craze Baggies shorts that will make your girly go crazy! I love getting the most out of my patterns. 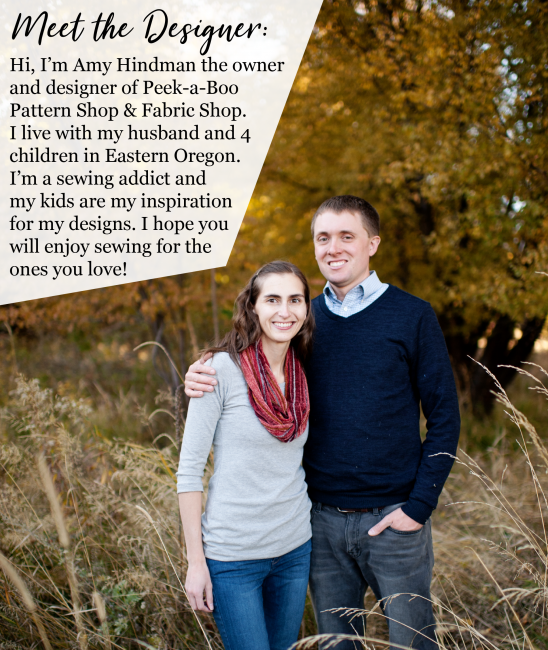 And I also prefer to make my children’s clothes because I know it will actually fit! When we shop in big box stores, my kids usually ask “Mom, can you make this for me?” instead of “Mom, will you buy this for me!” I’ve taught them well! 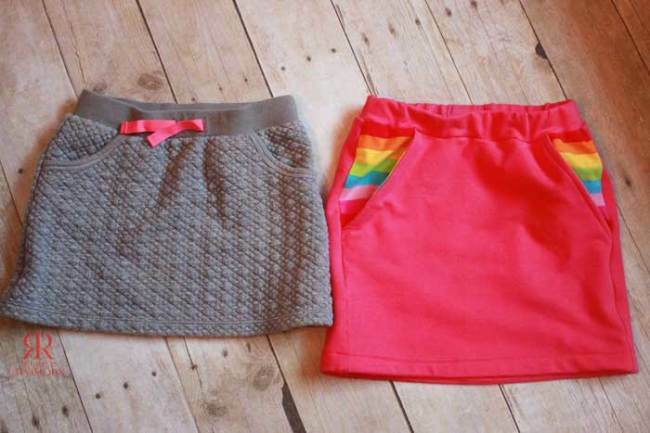 Currently, my daughter’s favorite skirt is a simple grey knit skirt (above on the left) with front slash pockets and a knit elastic waistband. She seriously wants to wear it every single day. In order to wash it, I knew I’d have to make a replacement! Off to the fabric stash! If she picks out the fabric, there’s a greater chance that she’ll wear the outfit. 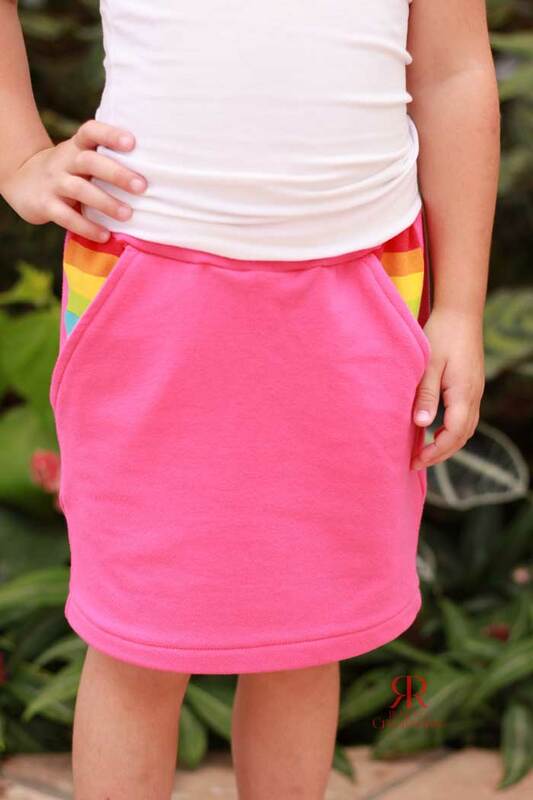 For this skirt, she chose a hot pink French Terry. I suggested the striped cotton lycra for a fun pop of color on the pocket lining. Let’s get started on the hack! First, print the size you’ll need according to the measurements chart in the Coastal Craze Baggies pattern. Once it’s taped together, draw vertical lines down the front and back pieces to get rid of the faux fly and the legs of the shorts. 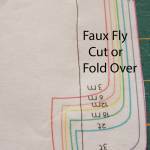 For the Front pattern piece, fold the faux fly piece over or cut it off. Now take a ruler and draw a line from the new top corner (which will now be the center front of the skirt) straight down to the bottom hem. This will cut off the legs part of the shorts. You’ll do that last step for the Back piece also. Next, let’s trace the pieces onto freezer paper so that we will have new pattern pieces and won’t have to cut on the fold. Simply lay the pieces down and trace around half of the pattern piece, then flip it over and continue the shape, forming complete new pattern pieces. Now it looks like a skirt pattern! Place these on your fabric of choice and cut out your pattern pieces. Also, cut out the pocket pieces and waistband as the pattern instructs. 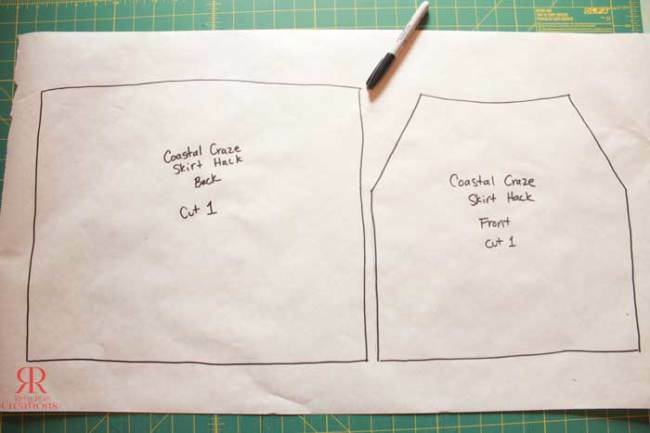 Sew the pockets on according to the pattern instructions. For this skirt, my fashionista requested I leave off the pocket trim. I simply attached the pocket and then flipped and topstitched the seam allowance. After after attaching the pockets and basting the raw pocket edges to the front of the skirt, lay the Skirt Back on top of the Skirt Front RST. You’ll notice the back is wider than the front to provide extra room in the rear. Sew the pieces together along the side seams. 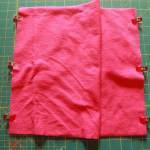 Finish your seams with a serger, pinking shears or overcast stitch if you’re using a fabric that frays. 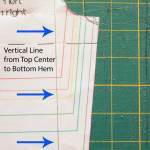 Next hem your skirt 3/4″ and follow the pattern instructions to attach the waistband. You’re done! 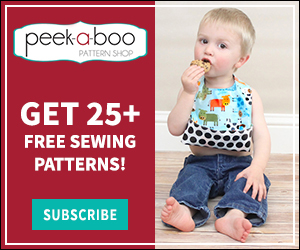 A simple hack to allow you to get a little more out of this fantastic pattern!